The prolific French cartoonist Lewis Trondheim keeps a public diary in comics form — doodles with casual but impressive water­colors — translated into English as “Little Nothings.” (For whatever reason, he draws himself with an ungainly, monobrowed bird’s head.) 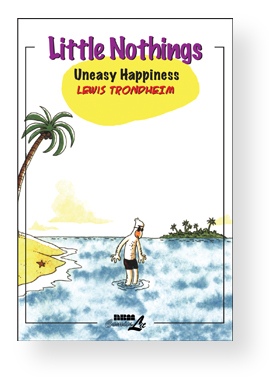 In the third volume, LITTLE NOTHINGS: Uneasy Happiness (ComicsLit/­NBM, paper, $14.95), he figures out how to deal with a mouse in his home, travels to Fiji, feels guilty about wanting an iPhone and so on. It’s very gently funny but splendidly assured and evocative of place — if a friend had drawn you a page of it as a letter, you’d treasure it forever.